I am Lama Nubri. I was born in the village called Pari, Nepal. 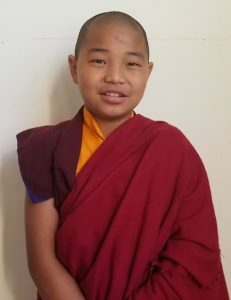 I study in class 2 along with my brother Dorje Nubri in the same class. I’m 12 years old now. When I was small I studied in my village. I was born in a very poor family. My father is a wood cutter. My mother used to work hard but our father always used to get angry with our mother and beat her like anything. When I was seven years old she passed away. After that we became completely helpless. Our father began to beat us more and more. He engaged us in the domestic work rather than sending us to school. We used to be afraid of our father because he drank alcohol and beat us. One day our mother’s brother Gonpo came and took me and my brother to his home. Next day he brought us to the Diwakar Buddhist monk school in Takdah to register us and then he went back. Now we are studying at that school since 2015 after Nepal earthquake. This school is good because the teachers teach us very nicely. We are getting love from them more than from our parents. There are many friends who are very poor like us and some are orphans. We need other help in our day to day life. I feel so great here with my younger brother. Thanking you whoever support our life & education!